"Yeah!!! – Cutting the two stops from the Scarborough Subway Extension was a mistake; I would even go so far as adding a forth stop at Brimley and Eglinton"
"Yeah!!! 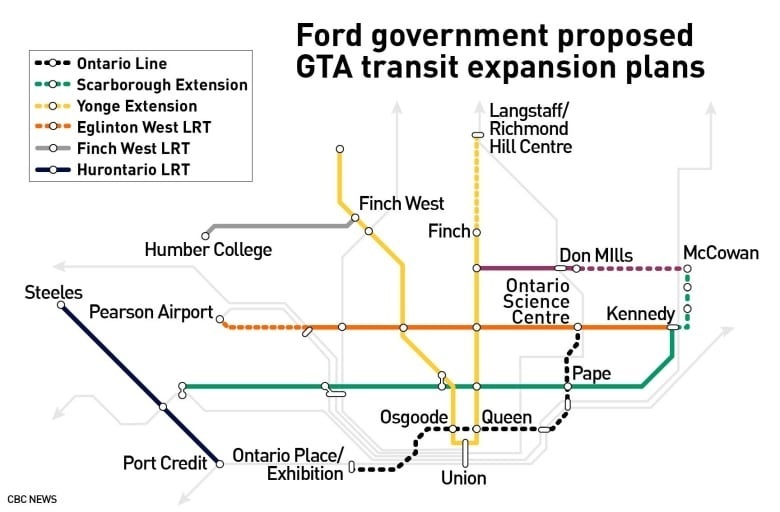 - Ford’s plan to route the Line 4 and SSE extensions through McCowan and Sheppard is the way to go – It’s a perfect opportunity to eventually extend the subway north to Markham; it’s the right location for a major parking facility and transit hub (not Scarborough Centre and the City was planning to do)"
"What can I say but, Yeah!!! – The Lawrence Avenue bus routes are some of the busiest bus routes in the city – The station at McCowan and Lawrence will result in shorter and faster trips for so many – I’m not a big fan of SmartTrack; I can take or leave the Kennedy and Lawrence SmartTrack Station, but if we have to choose, the McCowan and Lawrence Subway Station is a far superior option"
"With Ford's changes still to come; my best guesstimate is that they are still at least 3 or 4 years away from putting a shovel into the ground"